Sri Venkateswara College of Engineering and Technology was promoted by Sri Venkateswara Educational and Cultural Trust, Chennai. The institution was established in the year 1999 with a clear goal of providing quality education for the benefit of students of underprivileged, downtrodden of the Telugu Linguistic Minority in the area of Thiruvallur and the adjoining areas where Telugu Migrants predominantly inhabit.The college started functioning from the academic year 2000-2001 with the approval of AICTE, New Delhi and affiliated to Anna University, Chennai from 2001 onwards (Previously affiliated to University of Madras up to 2001), with three under graduate programmes namely Computer Science and Engineering, Electrical and Electronics Engineering and Information Technology. In the year 2002 Electronics and Communication Engineering was introduced with intake of 60. The Civil Engineering and Master of Computer Application was introduced in the year 2003.The Master of Business Administration and Mechanical Engineering departments are introduced in the year 2004 and 2005 respectively. At present the Institution functions with six under graduate courses in Engineering & Technology and two post graduate courses. The Institution spreads over 27.8 acres with buildup area over 2, 52,000 sqft. All the laboratories and workshops are fully equipped. The Library Spreads over 6,000 sqft and stocked with more then 28,000 volumes of books includes Engineering & Technology, Management, Computer Applications, Science and Humanities and 186 National and International journals along with online journal through DELNET are available in the library. Five acres exclusively for sports for both indoor and outdoor games and world class Gym. The College has received approval from the All India Council for Technical Education, which is the apex body for all institutions offering technical courses. The college is presently affiliated to the Anna University Chennai. Further, it has also applied for, and received minority status from the State Government. The college has been certified by the ISO 9001:2008, in 2009. To emerge as a respected provider of Knowledge.To develop an educated society with cutting edge support systems, industry interactions and career opportunities for the younger Generations. To grow as a premium educational institution. To provide quality education to the deserving students. To Shape up a vast resource of talent pool that will serve the nation. Making it force to reckon with. Sri Venkateswara College of Engineering and Technology, Thiruvallur offers various graduate courses as well as Post Graduate courses. 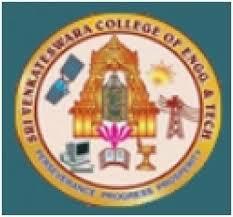 Sri Venkateswara College of Engineering and Technology, Thiruvallur is affiliated to Anna University, Chennai. List of facilities available at Sri Venkateswara College of Engineering and Technology, Thiruvallur for students.